This is a façade with very rich details that you captured very well. The presence of people on the stairs enhances this beautiful picture. 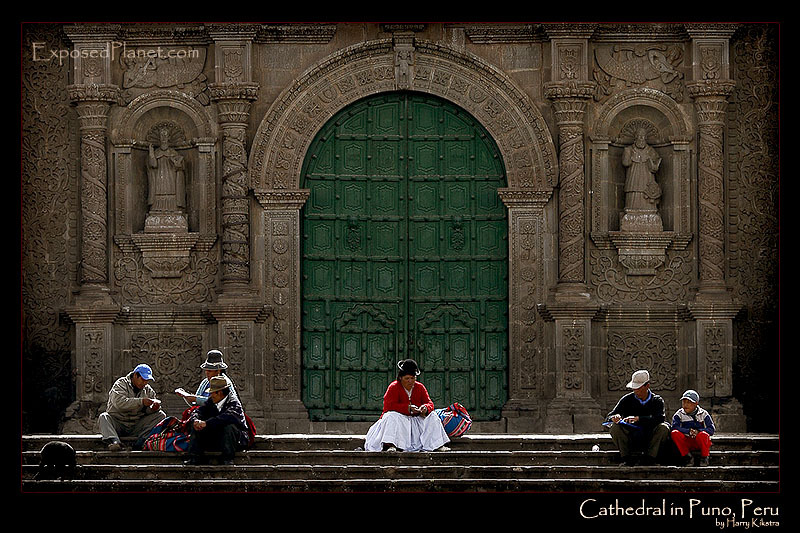 the details have come out very clearly and the people in front of the cathedral just adds to the beauty of the image! The story behind "The Cathedral in Puno, Lake Titicaca, Peru"
Hugging the shores of Lake Titicaca, the highest navigable lake in the world at about 3800m /13,000ft, lies Puno. Just a few hours later this relaxed scene would be one big party when the yearly world renowned Diabladas Festival for the Virgin de La Candelaria (about 2.5 weeks every early February) had it’s local try-out with a several hundred brass musicians and hundreds of dressed-up dancers. As anywhere in the world outside North America, East Asia and Western Europe, people take the time to relax, socialize and get warmed up by the sun.